I can't believe our little munchkin is FIVE! 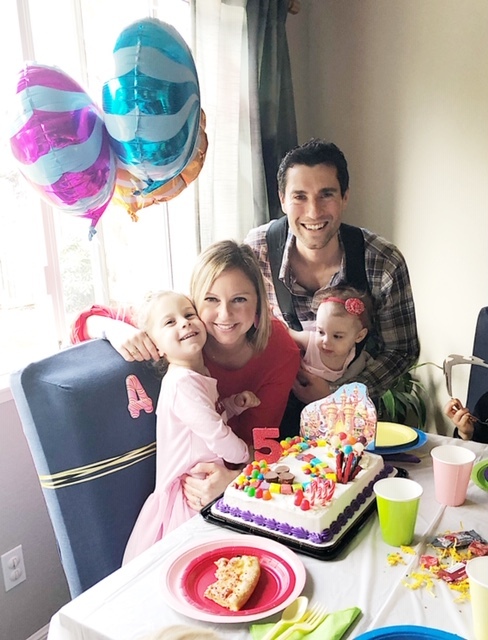 A few weeks ago, we had a super sweet bash for her. More below! First things first, we had to block off these stairs, so the party animals didn't monkey around upstairs! I crafted this out of a giant box , tablecloth, foil balloons, and stick on letters. Since we had eighteen five year olds running around, I wanted to create different activity stations to keep them busy! This photo booth was one of them. I wanted to go oldskool and have the kids all sit at the table to sing Avery happy birthday and eat cake, so we turned our dining table and added on a banquet table. More decoration details! Guys, this is ALL from the dollar store! No table is complete without centerpieces. 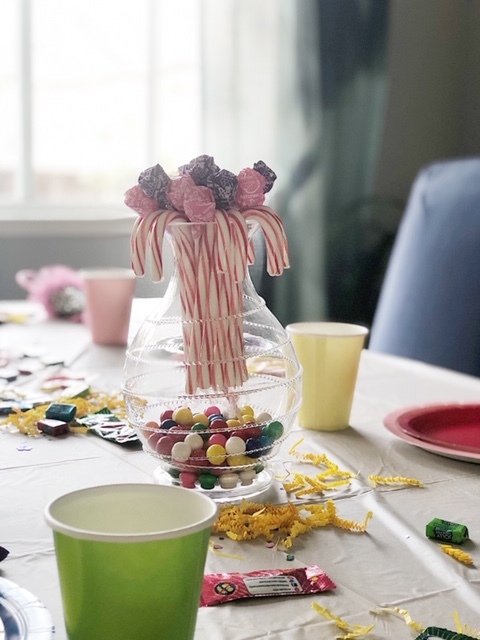 So grabbed vases that we already had and made these candy displays. This one is a nod to Candy Land's "Licorice Lagoon". 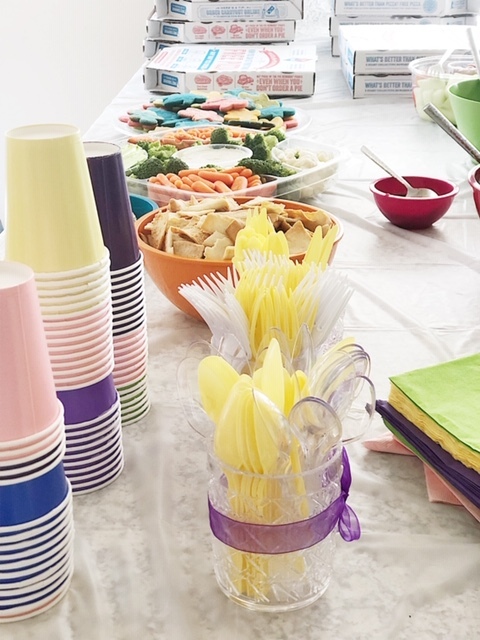 I tied this ribbon around the cupcake platter so the party animals didn't get their little paws into them early! Also wrapped these random empty boxes for more festive decor. We went for color here, as you can see! We did a casual lunch buffet for the grown ups. Kept it simple with pizza, apps, beer and spiked spritzers, because, #sundayfunday. More happy, colorful decor! Thank you Amazon! One of the activity stations - I simply google image searched candy land coloring scenes and printed them. I also got a Melissa and Doug sticker book that was a big hit! We took a jar of candy, tied a ribbon and some balloons around it and boom! you’ve got an adorable festive centerpiece. 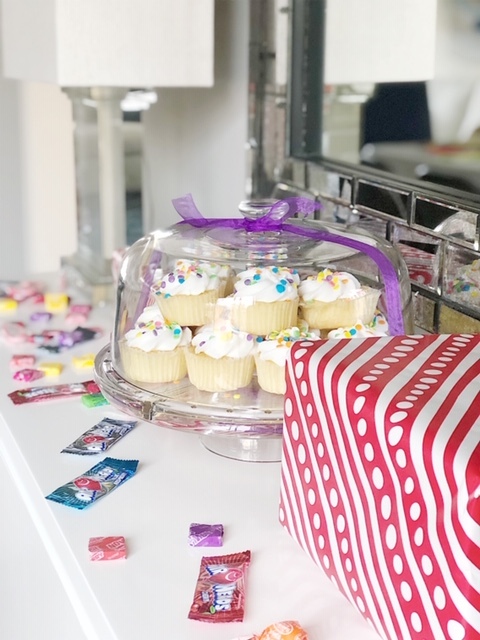 our white painted mantel with non committal art is the perfect back drop for more candy and party decor! 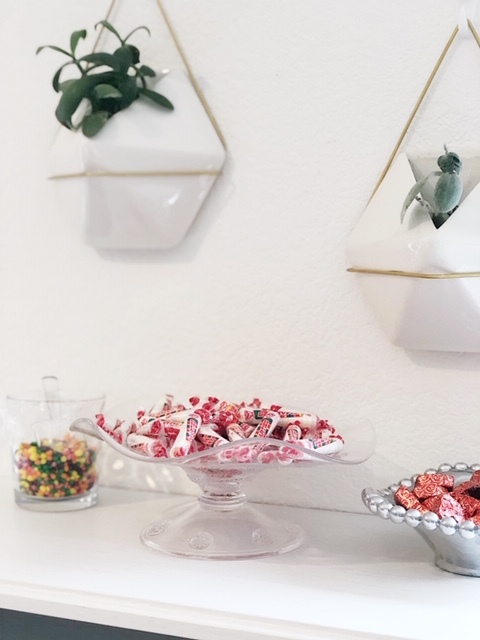 Who knew that candy made such great mantel decor! Also it was the perfect place to store this - up high where little hands couldn’t get into it until it was goody bag time! 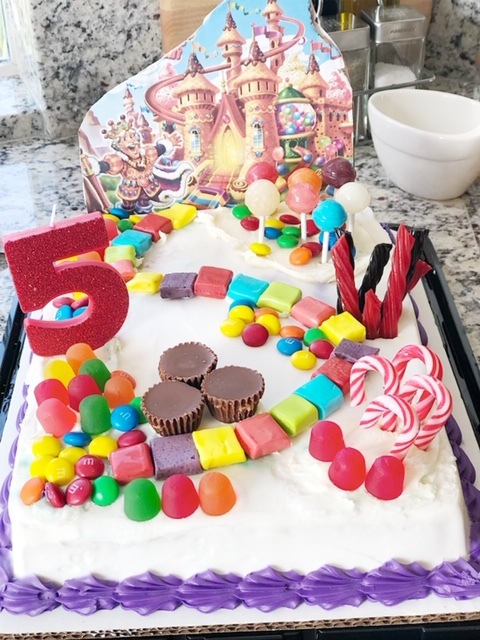 My amazing sister Jilli took a plain cake and decorated it based off of the Candy Land board! How adorable is this?! Family photo op. Eden was fussy all morning, so Eric decided to wear her at the party. Also so she didn’t get run over by crazy sugared up big kids! 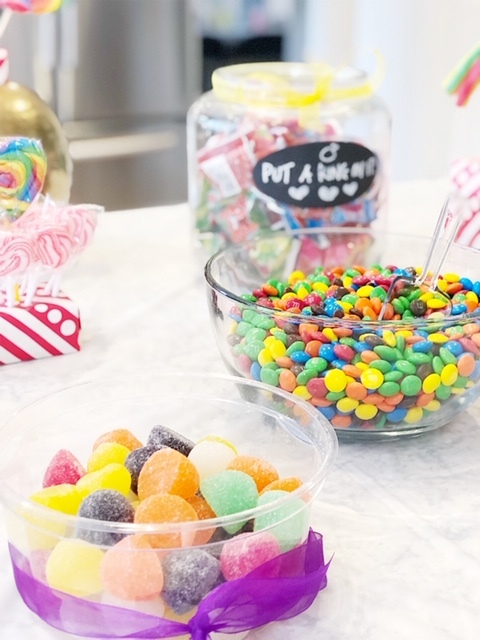 While eighteen five year olds and one adult (me) were bashing up a lollipop pinata, jilli grabbed all the candy placed around the house and set up the candy bar. 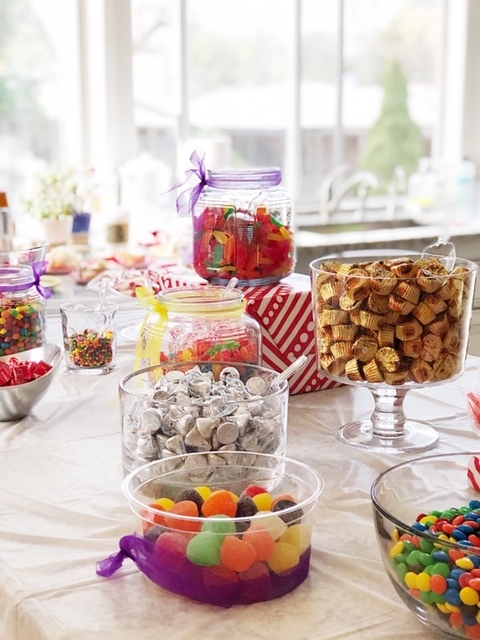 I’ll admit, we went a little nuts with the sweet treats! Jilli and I made these lollipop displays by using floral foam pieces and wrapping paper. So easy and cute! We also used the wrapped boxes previously on display in the dining room as stands to get some different heights for the candy bar. Mama’s favorite on the right! Poll - who actually likes gum balls? But they looked so cute! I made these cookies to mimic the little red, yellow green and blue gingerbread playing pieces from candy land, but they came out a little more tie dye - next time I’ll know to use more food coloring! And, so no one had to get a cavity filling as a result of coming to Avery’s birthday party, we included pre-pasted tooth brushes for both adults and kids. Must be the mom in me, but it made me feel less guilty. hah! Well, there you have it! So fun, but also so lock work! 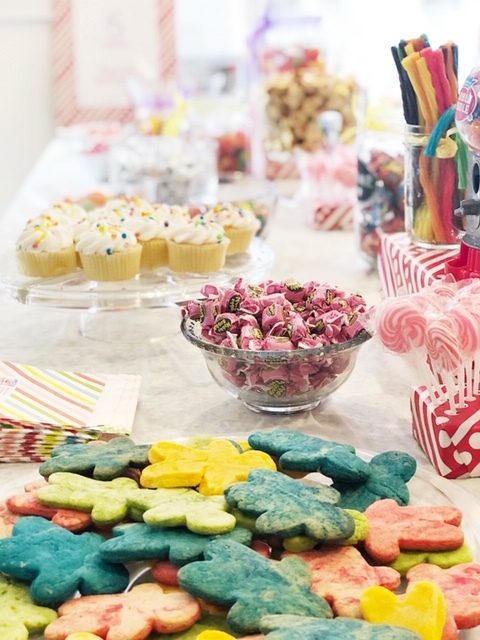 Thinking we’ll have to do every other year for a home diy bday party!